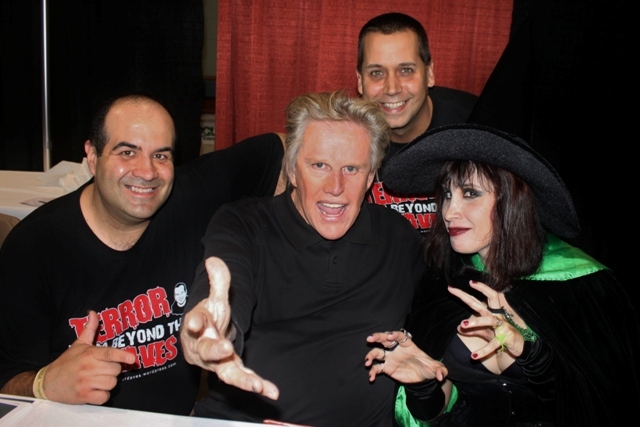 Gary Busey and The Horror Host Connection! Busey has definitely lived a full and eventful life which, aside from his impressive resume,’ includes a battle with drugs and severe head trauma due to a motorcycle accident sans helmut. 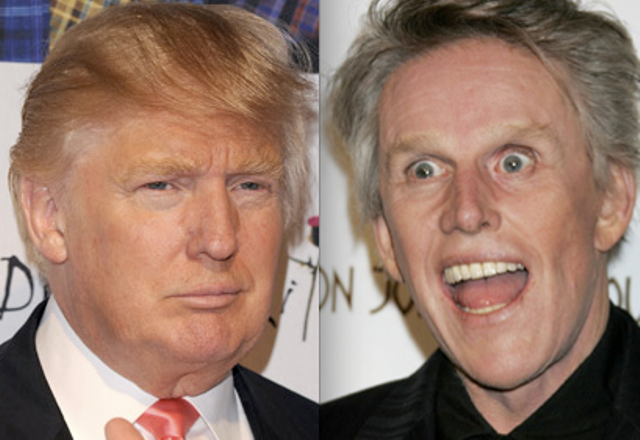 This has made Busey’s behavior impulsive, erratic, and at times difficult for those around him. During “Celebrity Apprentice,” Busey’s team mates didn’t seem to know what to make of him – eventually leading to an on-screen meltdown of the normally mild-mannered singer – Meatloaf. Meatloaf wanted Busey out of there faster than a Bat out of Hell! Ever gracious to his stars (who compete on the show in an effort to raise funds for their respective charities) Trump suggested in the Board Room that Busey was really a clever genius and that throwing others off of their game was all a part of it. Whether Busey is “crazy like a fox,” or just plain crazy is debatable. Either way, I confess that BOTH David and I were afraid of meeting him. We Daves, however, are above all things loyal. If you’re good to us – we’re good to you and when our friend Richard Braden (who assists us with many of the graphics on this site) requested an autograph, David Albaugh was determined not to disappoint him. 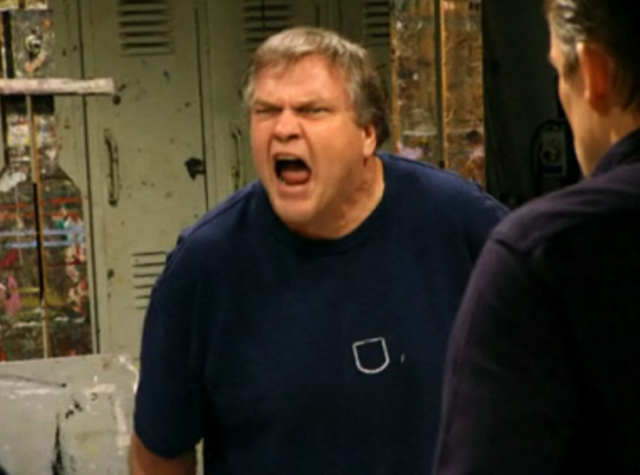 I wanted to strangle Richard for not suggesting an easier quarry but, at the same time, joked that maybe Busey would get snippy with me on video – in which case we could have a YouTube/”Talk Soup” viral hit on our hands (like when he barked at a young girl requesting an interview a couple years back). Like it or not….we were going to have to face him and hope for the best. This would prove a lot easier said than done. 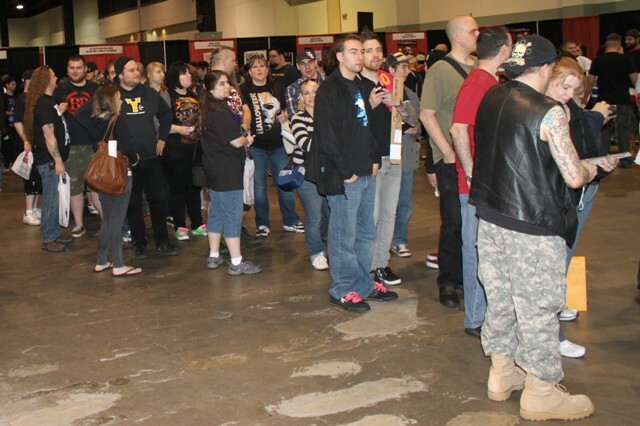 Busey’s autograph line began forming as soon as the convention opened Saturday morning but, for the first couple of hours, he was a no-show. As David and I circled the hall we’d cosntantly see the same people holding their ground while grumbling. 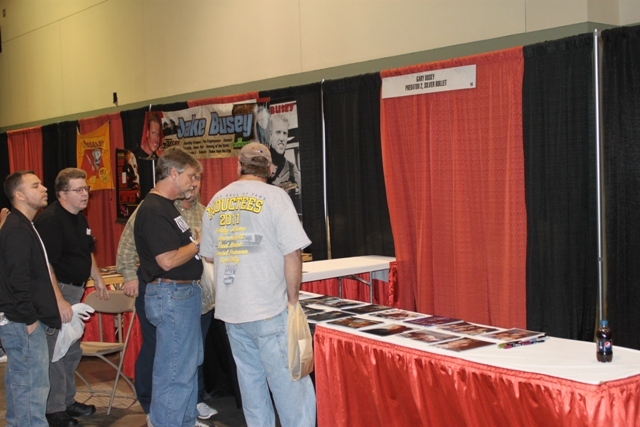 Busey had been slated to appear at last year’s ROCK N SHOCK and also at DAYS OF THE DEAD this past July but never showed for those events. We knew that he was at this one as we had seen him hobnobbing with Asia and Anders Eriksen the night before and were comforted as he appeared pleasant. Busey finally showed up and made a point to walk over to some of the folks standing further down his line and thank them for waiting. After that, the line moved fairly quickly and, as we waited, we chatted with our friend Penny Dreadful. Penny seemed eager to meet Busey as well and, when the time came, we invited her to join us. Thank heavens we did! Suddenly Busey stopped what he was doing and slowly looked up at me. I felt sweat trickle from the back of my ears as I suddenly was eye to eye with a now less amiable looking star. I tried to move but couldn’t as I was now firmly locked in that Jim Carrey/Fire Marshall Bill stare. “I enjoy absolutely EVERY project that I’m a part of” he said coldly – while maintaining his flat expression. It was at this point that Penny Dreadful swooped in and saved the day. As soon as he turned and saw her (along with her considerable assests) he began glowing and became jovial. Apparently among Busey’s accomplishments, he had also tried his hand at “horror hosting” at one time as well. 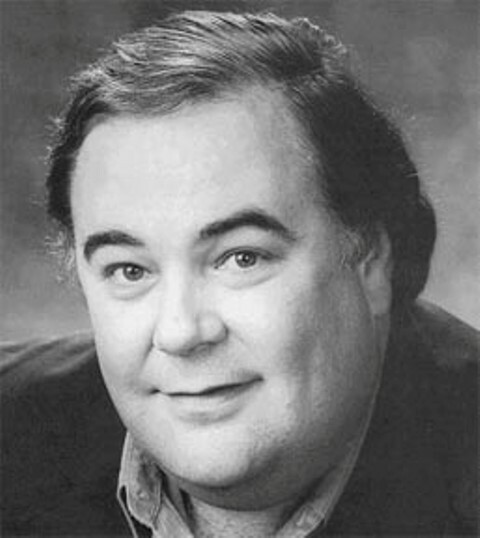 Penny remembered him on a local show back in the 1970’s called Mazeppa which used to do skits and show horror/cult films. 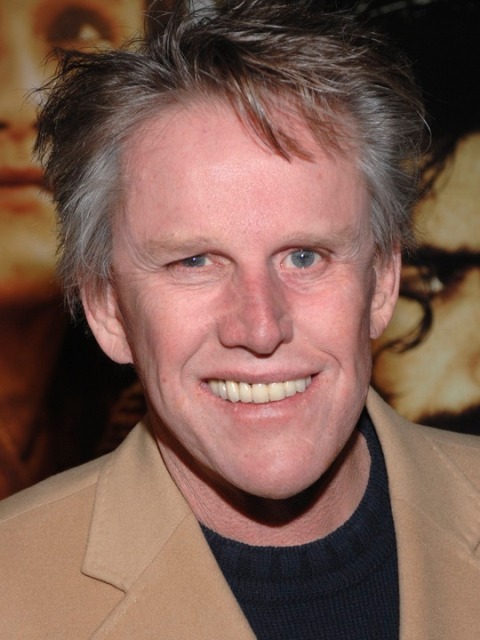 The show’s host was a man named Gaylord Sartain and Busey had been his sidekick (usually punching his host out by the show’s end). Whatever brain damage Busey may have sustained, he had NO trouble recalling this experience and lit up when Penny brought it up. He shared a couple of stories of the show with her and, by the time they’d finished, it was safe now for me to sit next to him for a photo. I’m not entirely sure what would have happened if not for Penny quickly putting him “under her spell.” I am pretty sure that it wouldn’t have gone off as nicely as it did. I just don’t think Busey and I are all that compatible. Certainly not if there’s any truth to astrology. I may as well tell you, I have the same birthday as Meatloaf (9-27). This entry was posted in Celebrity Encounters!, Convention & Expos, Horror Hosts and tagged Celebrity Apprentice, Donald Trump, GARY BUSEY, Meatloaf, Penny Dreadful, ROCK N SHOCK, Witch. Bookmark the permalink. ← The Halloween Tradition of “Trick or Treating! Dave, I really enjoyed your article – My family and I are all enchanted by Penny and Garou as well, so I can see how she could have used her magical powers to save the day! I have to say that I was a little surprised to read your comment about Linda Blair. My son had a celebrity interview website, and we had the opportunity to work with Linda last year. We did a video about her Worldheart Foundation, and she was extremely gracious. We volunteer with a local animal rescue group, and when she found that out, she and I spent quite a while after the interview talking about some of the challenges, and she gave me some information to take back to my supervisor about fundraising opportunities. My guess is that so much has happened to her since her Scream Queen days that it might feel like an entire other lifetime. After all, how many people over 50 are still the same person they were in high school? Is it fair for her to use her adolescent fame to raise funds for her charity work? All I can say is, knowing what I know about the expenses and hard work involved, if I were her, I would do it in a heartbeat! 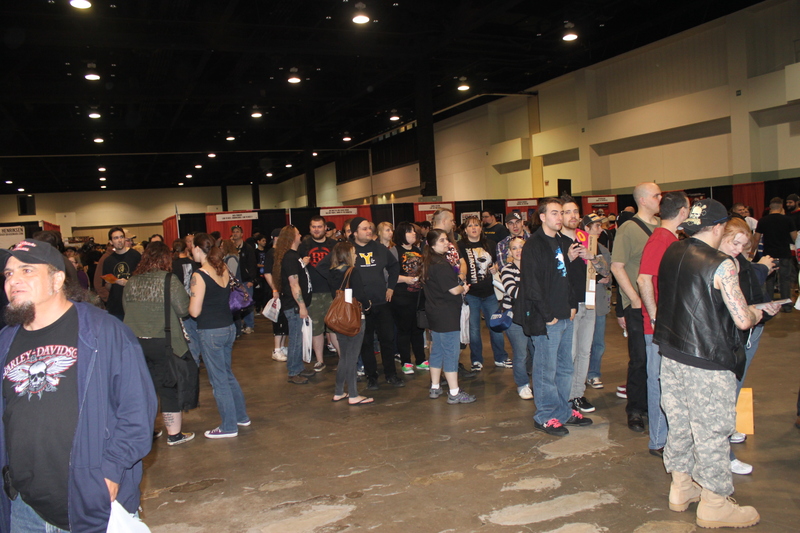 At any rate, it sounds like you had a very memorable experience at Rock and Shock. That’s one of those shows that I hope we have the opportunity to attend someday. Gary is a real sweetheart. He is most definitely unique, can be intimidating at first but he is one of very few people that we truly believe has a heart of gold. Genuine eccentric genius of a man!